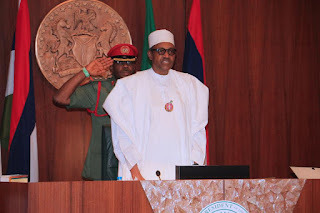 President Buhari today reiterated his commitment to eliminate corruption in campaign financing in the country, pledging that he will not authorise the use of any money from the treasury for his re-election campaign. “As political parties spread their ideologies and views to every nook and corner of the country, the issue of cash payment to voters and its corrupting influence in electioneering has once again become a topical issue. Try and use text and multi-media messages to seek votes for the party and government. ‘There is no money from the treasury for use in the campaigns. I will not authorize that,” he said. ‘‘This message needs to be taken to all Nigerians but we cannot use money from the treasury to share out to prospective voters. Nigerians want change and we alone can deliver that change. Our people can no longer be swayed by money politics,’’ he said.